I was commissioned in 2013 by the Cumbria Museum Consortium to devise, specify and help produce a large scale Arts Council-funded public engagement project which started with little more than a title ‘Voices of Cumbria’. I worked with the museums in the Consortium, other Cumbrian museums and local interest groups to define exactly what the project would be and how it would work. I held multiple brainstorming and content-shaping sessions museums, taking in everyone from senior curators to front-of-house staff. 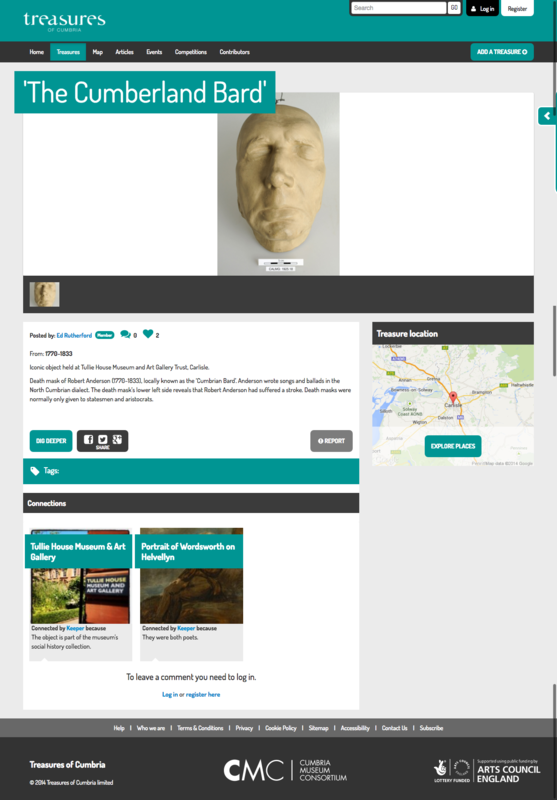 The final specification was for an online, mobile and print project called Treasures of Cumbria. A Treasure was defined by me as ‘a thing, person, location or idea that is valuable to someone and comes from Cumbria’. Museums and local people could add their own Treasures to the main website – so anything from a museum’s Roman dagger to your granny’s old teddy could be (and were) submitted. A series of spin off competitions and features (‘Cumbria’s Favourite…’, ‘Six Degrees of Treasure Separation’ etc.) 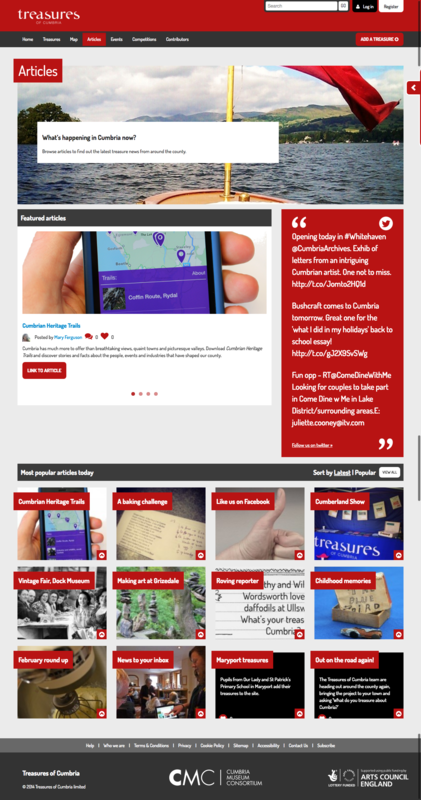 kept the interest high and a mobile app provided a series of walking tours, all of which were based around – and took users to – Treasures in the countryside and towns of Cumbria. I handed over a 170+ page document which laid out the rationale and all plans for the project and provided a full working blueprint for the Consortium to recruit for and run the project using a mixture of new staff and existing agencies. Included in the document were detailed project briefs for the website and related digital projects; during the tendering process to build the Treasures website we were told, ‘this is the best brief we’ve ever responded to’.